We launched In-app Billing on Google Play a year ago to give developers more ways to sell and engage users over the lifetime of their apps. Since the launch, In-app Billing has been extremely successful in helping developers monetize their apps through try-and-buy, virtual goods, upgrades, and other popular business models. Today, 23 of the 24 top-grossing apps in Google Play use In-app Billing, and the total revenue generated from in-app purchases exceeds revenue from traditional app purchases. We’re now taking In-app Billing further by adding another important business model &mdash; subscriptions. Starting today, developers can use In-app Billing to sell monthly or annual subscriptions from inside of their apps. All subscriptions are auto-renewing, for every app and game and every type of subscription product. Developers just set the price and billing interval and Google Play manages the purchase transactions for them, just as it does for other in-app products and app purchases. 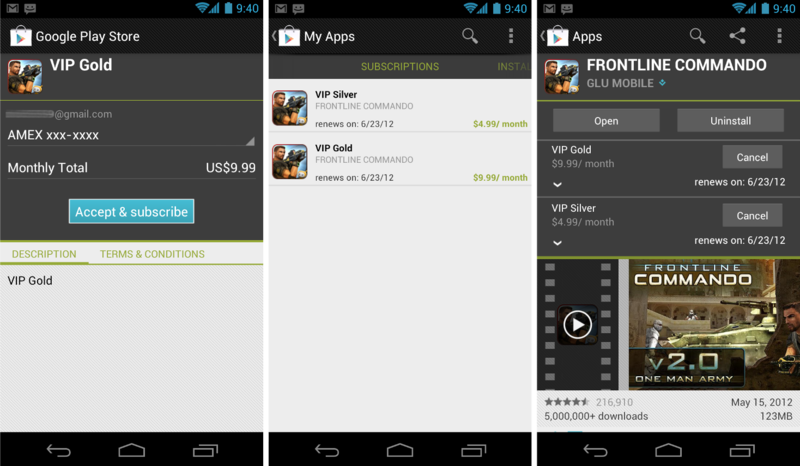 For users, Google Play provides a familiar and convenient purchase experience, highlighting subscription details such as price and billing interval before continuing with purchases. After the transaction, Google Play manages recurring billing and keeps users informed of new charges, sending them an email with each renewal. At any time, users can visit My Apps in the Play Store app to view their subscriptions and cancel any subscription as needed. While making it easy for developers to offer a great purchasing experience, our subscriptions are also designed for flexibility. Developers can use them to monetize premium dynamic content such as journals and magazines, but they can also use them to sell access to bundled products, game levels, music and video content, value-added services, or any other digital content. Building on Google Play’s strength as a truly cloud-connected experience, developers can offer users the ability to carry their subscriptions across multiple properties, services, or campaigns. To make this easier, we’re introducing an HTTP-based publisher API through which enterprise-scale backend servers can validate or cancel subscriptions. Using this API, for example, developers can extend access from their Android apps to their web properties, based on subscriptions that are purchased on Google Play. In the coming days, several developers will be launching apps with Google Play subscriptions and we expect many more to follow. Glu Mobile is launching updated versions of its top Android titles, including Frontline Commando, offering subscriptions through custom VIP currency packages. "We're using Google Play subscriptions to offer consumers a compelling value and a single currency which they can use across Glu’s most popular titles” says Niccolo de Masi, CEO of Glu. “We're excited to bring these capabilities to our Android users and we believe that Google Play subscriptions will fuel further growth in our business." If you’re a developer, you can get started with subscriptions right away by reading the In-app Billing documentation and downloading the updated sample app. If you are already using in-app billing, you’ll find that adding support for subscriptions is straightforward and involves only minor changes to your code. You can publish your updated apps and subscription products as soon as you are ready. We’ve already rolled out client support to most Android devices worldwide, so any user with Google Play 3.5 or higher installed can buy subscriptions starting today. We’re looking forward to seeing how you use subscriptions in your apps!